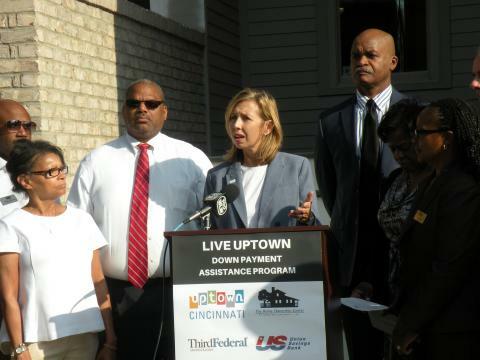 First-time home buyers have another reason to consider purchasing in the Uptown area, thanks to a new down payment assistance program from Uptown Consortium and The Homeownership Center of Greater Cincinnati. Debuted at a press conference hosted by Uptown Consortium and The Homeownership Center on Thursday, October 6, the incentivized program offers more than 50 down payment assistance grants, each for $1,500 per buyer, to those purchasing a home in Mt. Auburn, Clifton, Corryville, Avondale and Clifton Heights/University Heights/Fairview Heights (CUF). Homebuyers who have not owned a home in Cincinnati in the last three years are eligible to apply, and must live in the home for five years as an owner-occupant. The grants can be applied to down payments, closing costs and out of pocket costs. Beth Robinson, Uptown Consortium President and CEO, highlighted that the program will encourage individuals who were unable to keep their homes as a result of the housing crisis of 2008 to invest in the Uptown area. President and CEO of The Home Ownership Center of Greater Cincinnati Rick Williams noted that home ownership will always be important to neighborhoods. The “Live Uptown” Down Payment Assistance Program connects new home buyers to five historic neighborhoods located near several great Cincinnati institutions that are some of the largest employers in the city. The press conference took place at the popular new Hickory Place Townhomes in the Burnet Avenue Corridor where three of the eight tax-abated, market-rate homes have already sold in advance of completion. The program is supported by four participating lenders: Huntington Bank, Third Federal Savings and Loan, Union Savings and US Bank. To learn more information about the Down Payment Assistance Program, contact The Homeownership Center at (513) 961-2800.